Landscape edging can give your yard a nice curb appeal. Also called lawn edging and garden edging, landscape edging is when you create a barrier between your lawn and any other surface. It is common for lawn edging to be between the lawn and a garden, grass and a walkway, or even around a rock garden or flower bed. If you are wondering the purpose of landscape edging, you have come to the right place. Today I'll be going over the benefits of having landscape edging, different styles, the pros and cons of it, and how to maintain landscape edging so that your yard always looks spectacular. Let's get started. Why Should You Use Landscape Edging? You probably realize that the main purpose of landscape edging is to give your yard a nice, defined look. With landscape edging, you'll be able to clearly notice flower beds and gardens because it emphasizes the lines of it. Besides good looks, landscape edging is a great way to prevent grass from spreading into your flower bed. Also, you'll never have to worry about the lawnmower crushing little plants or guests stepping on the flowers. In addition to all these things, landscape edging prevents soil and mulch from coming onto your grass. 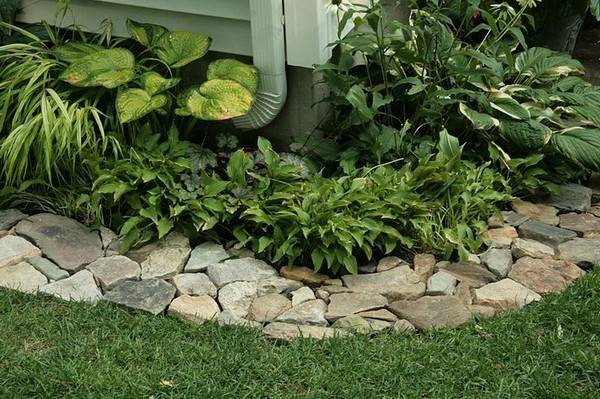 Landscape edging is definitely a great idea if you have flower beds or walk ways. Brick - Brick comes in a multitude of styles and is a good idea for a uniform look. This is probably the most popular landscape edging style. Plastic - Affordable and easy to install, plastic landscape edging comes in many grades and styles. Plastic edging is usually black colored, and can add a nice look to your yard. It is sometimes called pound in edging because you pound it into the ground. Concrete - There are many different styles of concrete landscape edging. You could use concrete blocks and stones, you could buy already made concrete that is ready to be set in place, or you could make your own concrete and mold it into the shape/style you desire. Wood - Wood edging lasts a long time (about 10 years) and can give your yard a natural look. Wood is also affordable and easy to install. Stone - Stone is another popular style that gives your yard a beautiful look. Stone can be carefully set in mortar for a refined look, or you could place them more irregularly. Both ways look nice. Wattle - This landscape edging involves weaving saplings of pliable wood, such as willow or dogwood, into a low fence. It has a look similar to a woven basket. Wattle works well for holding back mulch. 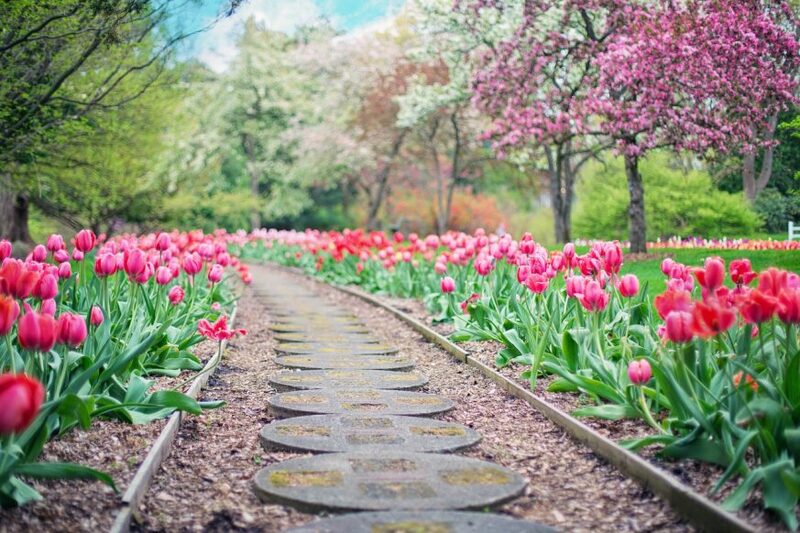 Are you looking for some landscape edging ideas to inspire you? Here are some ideas to try. You may have seen gabion baskets before. Gabion baskets are wired "baskets" filled with rocks. They can be used for holding things in place, but sometimes they are used for landscaping. If you are wanting to add a little creativity into your yard, you may want to try adding gabion baskets. Large bowling ball sized rocks can give your yard a unique look. It is also very simple to do. Simply set the rocks in place. Concrete can be one of the hardest types of landscape edging to install, but it will be worth it. The reason why it is so hard is because you first have to mix the concrete, then mold it into the shape you want, and then let it set. Keep in mind that concrete is more permanent than other types, so if you plan on changing your yard a lot this type may not be for you. 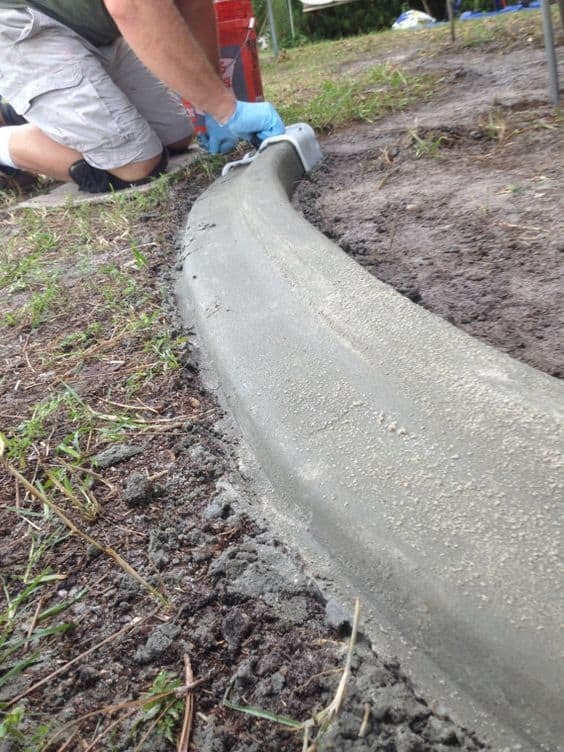 Concrete landscape edging doesn't just have to be poured concrete. You can also use concrete blocks or, like this, broken concrete. Broken concrete gives the flower bed a nice look. 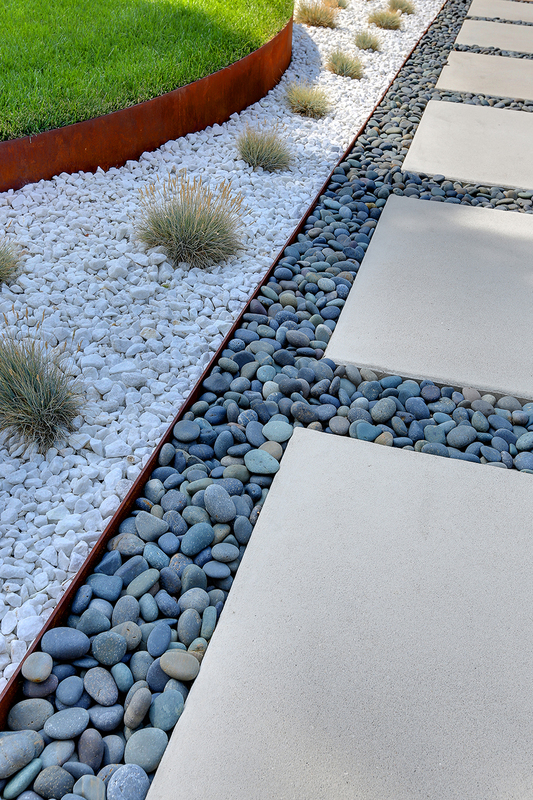 The mixture of small rocks and large square cement stepping stones give this yard a unique curb appeal. As you can see, there are two different landscape edging in this yard. The one to the left is a sheet of used metal used to keep the grass from growing in the rocks. Then, there is a small, short piece of metal that keeps the white rocks from mixing with the grey rocks and vice versa. 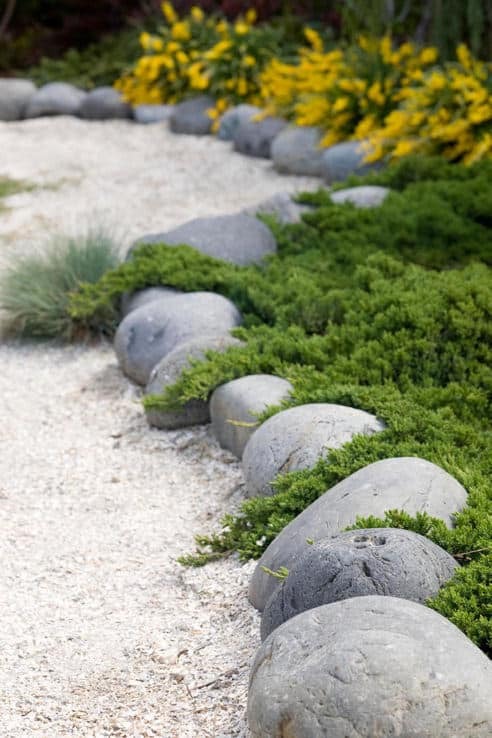 Now it is time to take a look at the pros and cons of landscape edging. There are mostly pros about landscape edging, but like all things there are a few cons. Pro: Landscaping gives your yard a nice curb appeal. It defines your flower beds and walkways and makes your yard look organized. Con: It can be expensive to do landscape edging. While there are some cheap options, such as plastic edging and wood, some styles can be expensive such as concrete or stone. If you hire somebody to install landscape edging you may end up paying a lot. Pro: There are so many styles available. If one style doesn't fit your needs, there are many more choices to choose from. Con: For some, it can be overwhelming when they see how many styles there are. If you don't like making decisions, you may find it challenging to choose a style that fits your needs. Pro: Most styles are easy to install. Plastic landscape edging simply involves pounding in the plastic. Wood is also easy to install. Con: If you decide to mortar your landscape edging (especially if you are installing stones), it can take a while to install it. If you are making your own concrete (mixing it, molding it, letting it set, etc. ), the process of installing will take a long time. 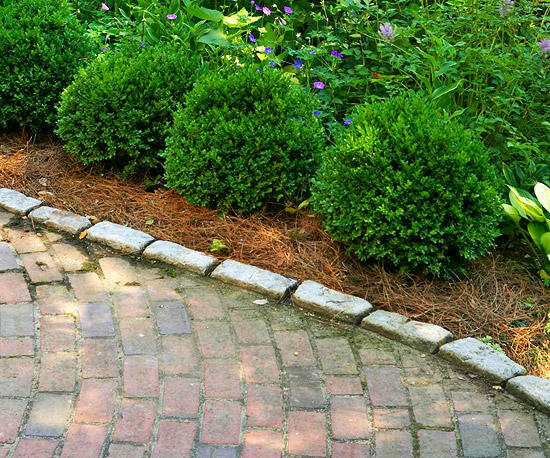 Pro: Landscape edging prevents little plants from getting stepped on. You'll easily see where plants are, and that prevents little plants from getting killed. Also, it prevents lawn mowers from accidentally running over the plants. Con: If you ever decide to change your yard, it can be difficult to get landscape edging out. It will be especially hard if you mortar cement or stones together. Pro: Landscape edging keeps soil in its place. Even if your landscape edging is flat and level with the ground, you will notice the soil more than you would if it was in the grass. Con: If the landscape edging is too flat and level with the ground, people might not notice it unless they go up close to it. 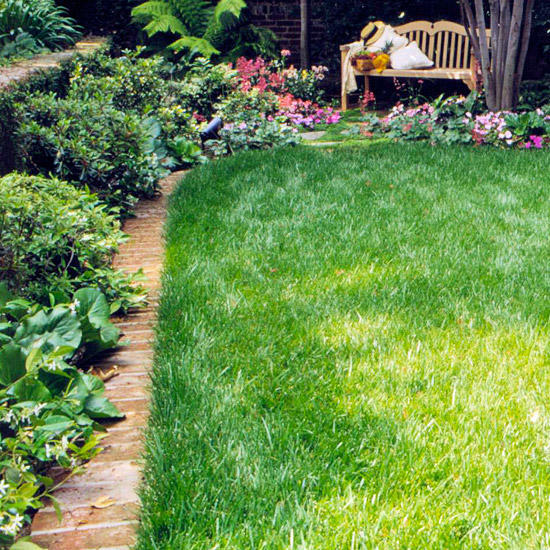 Pro: Sometimes landscape edging can prevent weeds from migrating into your garden. Con: If you don't mortar your landscape edging, it may begin to loosen and fall apart each time you step on it. String trim the grass - While the landscape edging is suppose to prevent grass from entering your flower bed, sometimes grass can overtake your yard. Spend some time string trimming the grass every once in a while so that it doesn't cover up your landscape edging. Push soil back into its place - If you notice soil on your landscape edging, take the time to push it back in its place. Fix loose bricks, stones, or wood - No matter what you installed, if you notice it has become loose make sure you take the time to fix it. This will prevent more future damages. Landscape edging is not too difficult if done properly. There are many different options for you to choose from. 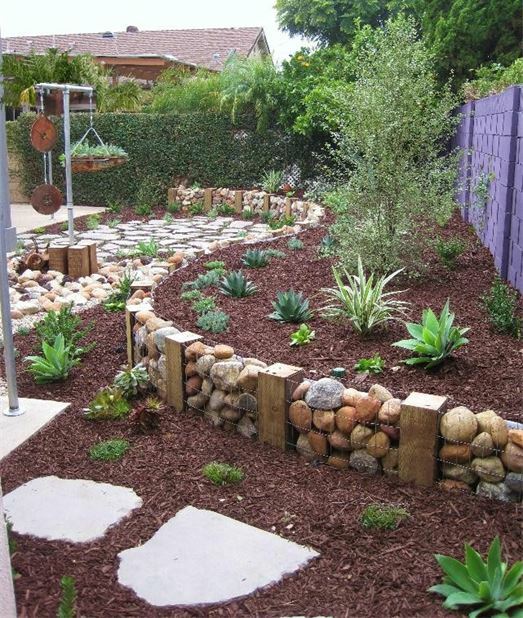 You could use bricks or stones to create your landscape edging, or you could use wood. 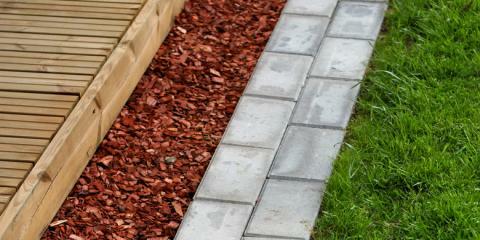 Plastic edging is also an option, or you could try concrete for a more permanent landscape edging. In this article I also went over a few creative landscape edging ideas to help give you an idea of what landscape edging looks like. Whichever style you choose to do, you will find that landscape edging will bring beauty to your yard and make it more organized. Besides that, it also prevents little plants from becoming crushed and it keeps soil in its place. Keep in mind that landscape edging can sometimes be expensive and some styles may be difficult to install. But all in all, landscape edging is a wonderful idea if you are wanting to give your yard a nice curb appeal.